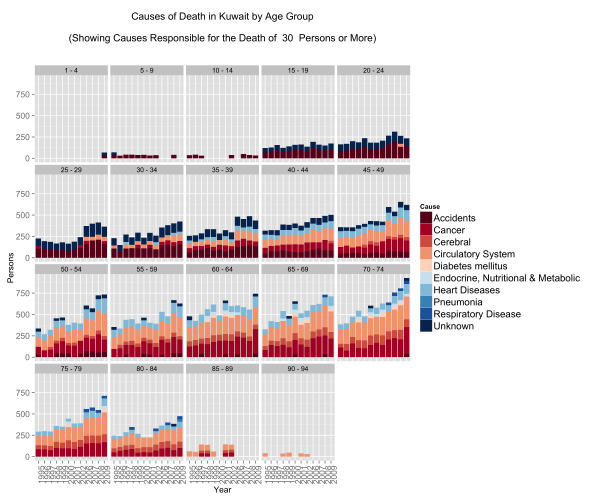 I came across Randy Olson’s (editor at @DataIsBeautiful) tweet about causes of death in the US. 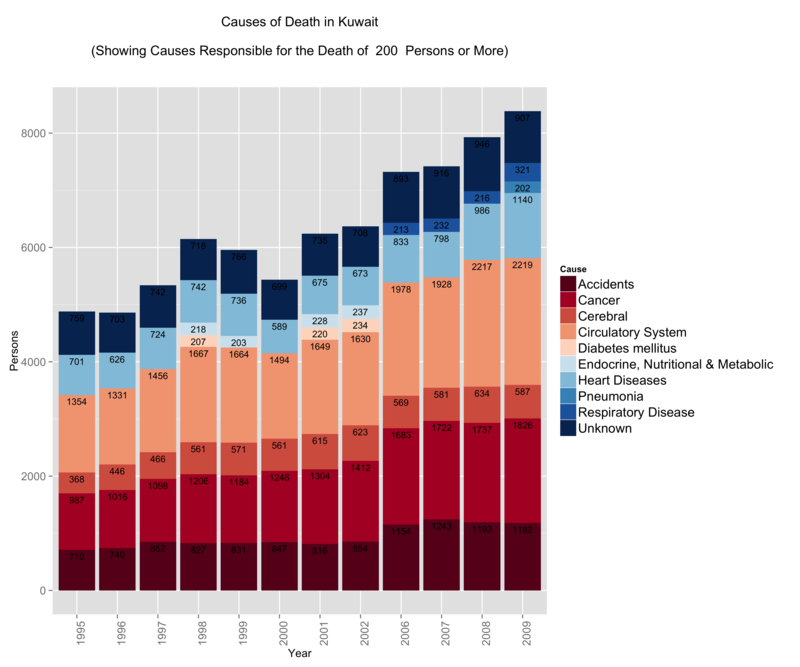 I thought I would replicate the information here using R and localize it for Kuwait – nothing fancy. What did catch me off guard is the number of people who die from circulatory system disease and heart disease. The numbers are not only large, but the trump both accidents and cancer figures. Interestingly enough, respiratory system diseases start to show up in 2006 just as problems with circulatory and pulmonary problems become more prevalent. I thought that this surely is controlled within a demographic group. So I decided to split the data into gender and age. Looking at the gender differences the first eye-popping fact is that less women seem to be dying … this is misleading because the population is generally bias towards men. There are about 9 men for every 5 women in Kuwait. The other eye-popping item that appears is in accidents. Less women pass away from accidents compared to men – a lot less! Is this indicative that women are safer drivers than their counterparts? Perhaps. In some nations this figure would indeed be zero because of social and legal constraints … it’s not necessarily good news … but it does stand out! Proportionally there is a higher rate of mortality due to cancer in the female population vs. the male population. Lastly, men seem to be more susceptible to death from heart diseases and circulatory system diseases. This might make you think why? Heart diseases and circulatory system diseases are exacerbated by sedentry life styles, poor diets, and other factors such as the consumption of tobacco. We have already looked at obesity in Kuwait … perhaps a deeper dive might shed some light on this matter. This one confirms that if an accident does not get you before you’re 25 then the rest of the diseases are coming your way. People fall victim to circulatory, respiratory, and heart diseases at extremely young ages. In fact what we see here is that irrespective of age group, after the age of 40 the mortality rates are the same for these three diseases. 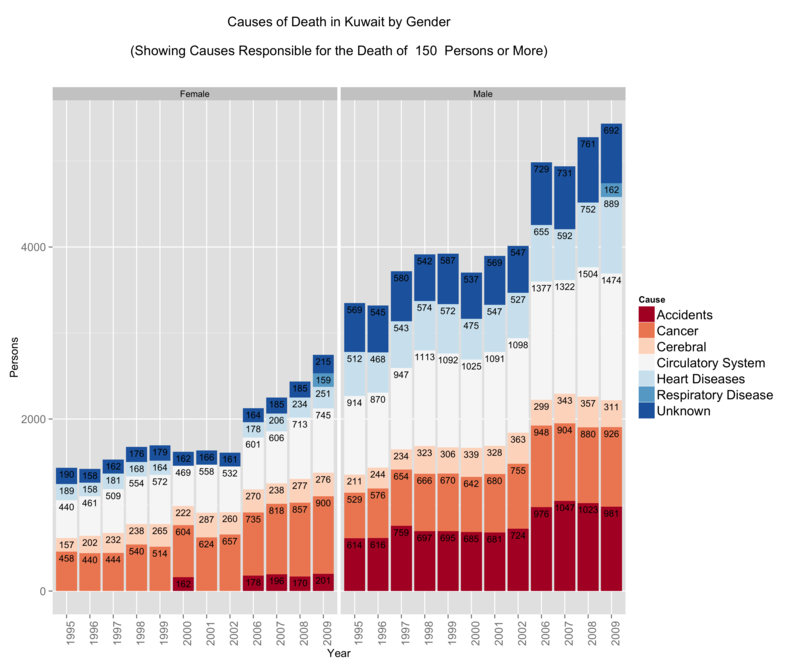 On the other hand, accident mortalities go down as people shift to older age groups but are displaced by cancer. What is terribly depressing about this graph are the number of people below the ages of 19 that die in accidents. These might be just numbers, but in reality these are very real names to families. 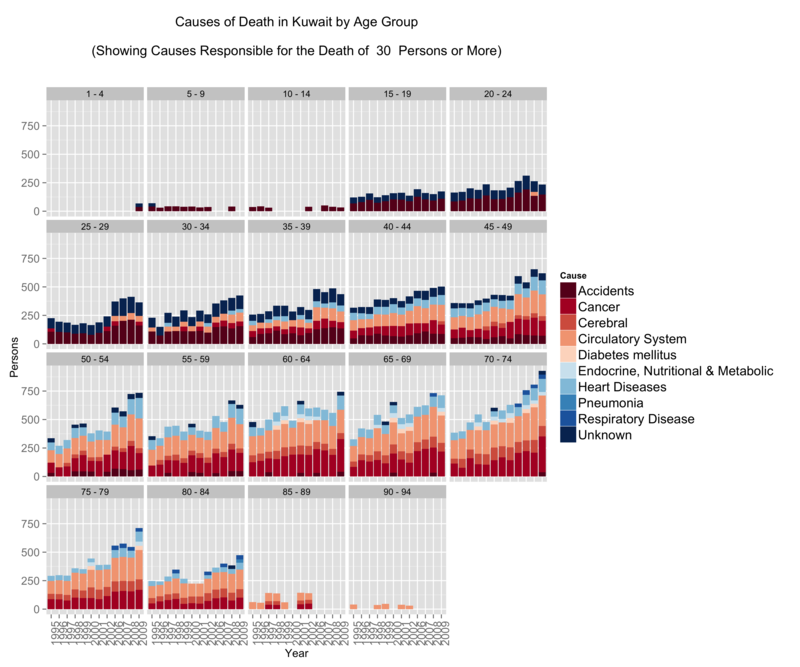 The graphs were just a fun way to play with R. What we can take away is that of the 5 main causes for mortality in Kuwait – Cancer, Heart Diseases, Circulatory Diseases, Respiratory Diseases, and Accidents – 4 of them are addressible through policy, regulation, and raising public awareness for social/behavioural impact. You can download the Kuwait dataset here or from the UN’s Data Portal. # Data cleaning, here we groups some items together for simplification. # Eg. All forms of neoplasms are grouped under "Cancer". data.mortality[grep(pattern="Certain conditions originating in the perinatal period",x=data.mortality$Cause),]$Cause<-"Perinatal period conditions"
data.mortality[grep(pattern="Endocrine, nutritional and metabolic",x=data.mortality$Cause),]$Cause<-"Endocrine, Nutritional & Metabolic"
data.mortality[grep(pattern="Diseases of the respiratory",x=data.mortality$Cause),]$Cause<-"Respiratory Disease"
data.mortality[grep(pattern="Diseases of the circulatory system",x=data.mortality$Cause),]$Cause<-"Circulatory System"
We covered Price Elasticity in an accompanying post. In this post we will look at how we can use this information to analyse our own product and cross product elasticity. 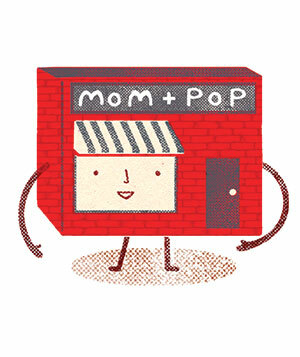 You are the owner of a corner mom and pop shop that sells eggs and cookies. You sometimes put a poster on your storefront advertising either your fresh farm eggs, or your delicious chocolate chip cookies. You are particularly concerned with the sales off eggs – your beautiful farm chicken would be terribly sad if they knew that their eggs were not doing so well. Over a one month period, you collect information on sales of your eggs and the different prices you set for your product. We are using a modified version of Data Apple‘s data set. Ad Type: the type of poster – 0 is the egg poster, 1 is the cookie poster. Sales Price.Eggs Ad.Type Price.Cookies "integer" "numeric" "integer" "numeric"
Since Ad.Type is a categorical variable, lets go ahead and change that and output the summary statistics of our dataset. Right now we want to see if we can predict the relationship between Sales of Eggs, and everything else. We now want to run a regression and then do some diagnostics on our model before getting to the good stuff. We can run the entire regression or add each variable to see the impact on the regression model. Since we have few predictors lets choose the latter option for fun. We look at our R2 and see that the regression explains 88.6% of the variance in the data. We also have a low mean squared error (2.611) compared to the other models we generated. We can actually get better results by transforming our independent and dependent variables (e.g. LN(Sales)) but this will suffice for demonstrating how we can use regressions to calculate price elasticity. First, we can address some of these points by creating plots of the model in R.
The plot on the left shows that the residuals (errors) have no pattern in variance (Good!). The red line is concerning because it shows some curvature indicating that perhaps the relationshp is not entirely linear (hmmm…). On the right we see that the errors are acceptably normally distributed (they are around the straight line … Good!). sqrt(vif(m3)) > 2 # problem? # Multi-collinearity library(car) vif(m3) # variance inflation factors sqrt(vif(m3)) > 2 # problem? The code above will show if any of the variables have multicolinearity issues that could cause issues with the model’s integrity. Generally we want values less than 2, and we have values of around 1 so we are good on this front. We see that there is definitely some issues with linearity but not to an extent that it is a cause for concern for the purpose of demonstration. So we keep calm, and move on. So we are clear to move forward with Price Elasticity and Cross Product Price Elasticity! (ΔQ/ΔP) is determined by the coefficient -16.12 in our regression formula. To determine (P/Q) we will use the mean Price (4.43) and mean Sales (30). This means that an increase in the price of eggs by 1 unit will decrease the sales by 2.38 units. 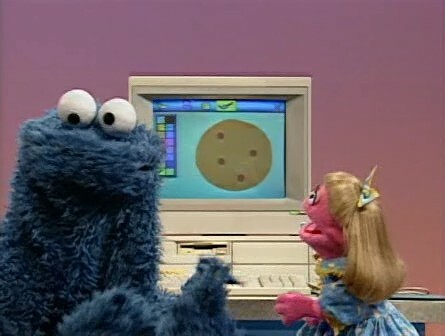 We know from our regression that (ΔQ/ΔPcookies) is the coefficient of Price of Cookies (-8.71). This means that an increase in the price of cookies by 1 unit will decrease the sales of eggs by 1.27 units. We now know that the price of eggs and price of cookies are complementary to one another in this scenario. Since you only sell too products, one explanation could be that people who come in for cookies and eggs would rather get them elsewhere if the price is too high. Also, it means that if you had to choose between a price cut on cookies or eggs, go with cookies! You are now in an ideal situation where you can run an optimization function to set the right price for both cookies and eggs. Can you figure out what to do with the Ads? 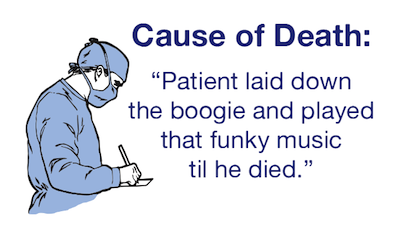 # Diagnostic on subsets' means and if they are different ... they are. # On average, does the advert for eggs generate higher sales for eggs?